Passive q-switching has become widely used technique in solid state lasers development. 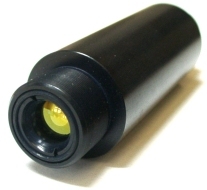 The application of saturable absorbers simplifies considerably laser design, makes it more compact and cheap. The saturable absorbers became successfully applied in diode pumped microchip lasers. Cr+4:Y3Al5O12 or Cr+4:YAG - is a material that can be used as an active media for CW, pulsed or self mode-locked tunable NIR solid-state lasers with tunability range 1340 - 1580 nm as well as a media for Q-switching in lasers with operating wavelength at 950 - 1100 nm. It is particularly useful in practical applications because of convenient absorption band of Cr+4around 1 mm which gives possibilities to pump it by regular Nd:YAG lasers. A saturation of absorption in the band at 1060 nm is useful for application in small sized Nd:YAG oscillators with flash lamp or laser diode pumping instead of based on dye or LiF:F-center passive Q-switches. Using the Cr+4:YAG crystal the self mode-locking (KML) regime is achievable. It gives an opportunity to build the laser source with pulse duration shorter then 100 fs at 1450 - 1580 nm. Gadolinium-scandium-gallium garnet doped with chromium and magnesium GSGG:Mg:Cr4+ is a material for passive Q-switching in 1 µm region. The valence state of chromium ion Cr4+ is provided by use of charge compensator. The crystals are grown by Zchochralski method in argon-oxigen atmosphere. Crystals of GSSS:Mg:Cr possessing the contrast parameter close to the one of YAG:Cr4+ have some advantages such as: possibility to provide necessary initial transmission at less thickness (typical thickness is about 1mm), transparency in the visible range which simplifies the alignment procedure. The crystals of Yttrium-Aluminum Garnet doped with three-valence vanadium V3+ in tetrahedral position suggest efficient q-switching for lasers operating in 1.3 µm region. The absorption band between 1.0 - 1.5 µm is attributed to 3A2 →3T2 transition of V3+ ion in tetrahedral position of garnet lattice. The crystals are grown by oriented crystallization method. Concentration of V3+ in tetrahedral position is controlled by growth and annealing conditions.The efficient q-switching of lasers operating at 1.3 micron has been obtained with a number of active mediums such as YAG:Nd, YVO4:Nd, KGd(WO4)2:Nd under flash-lamp and laser diode pumping. The new saturable absorber is based on NANOSIZED CRYSTALS IN GLASS MATRIX. It is transparent glass ceramics containing magnesium-aluminum spinel nanocrystallites doped with tetrahedrally coordinated Co2+ ions. The material provides q-switching within the spectral interval of 1200 - 1600 nm in particular for Yb-Er-glass laser (λ = 1.54 µm). Having the absorption cross-section of Co2+ at the wave length of 1.54 µm (transition 4A2 → 4T1(4F)) significantly higher than emission cross-section of Er:glass, it allows Q-switch operation without focusing radiation into the saturable absorber. In comparison with single crystals the glass ceramics is considerably cheaper. The glass ceramics technology is based on controlled nucleation and crystallization of the glass and has several advantages over conventional powder-processed ceramics as it uses glass preparation technique. They are: 1) ease of flexibility of forming in glassy state, 2) uniformity of microstructure, 3) reproducibility of properties that results from starting glass. Spinel crystal is a material having high optical damage threshold and low optical losses in 1.3 - 1.6 µm spectral range. Co2+-activated MgAl2O4 (Co:MALO, Co:spinel) can be used as a media for passive Q-switch of lasers which operate in the spectral range of 1.3 - 1.6 µm, for example 1.32 µm and 1.44 µm Nd:YAG lasers, 1.31 µm iodine lasers and especially 1.54 µm erbium glass lasers. High enough absorption cross-section of Co+2 ions together with practical absence of excited state absorption makes this material a very efficient passive Q-switcher (that does not require intracavity focusing) for various types of erbium glass lasers, including diode-pumped microchips. The Solid state Raman shifter RS-14 is an easy in operation device for expansion of the tuning range of a Ti:Sapphire laser. In the Shifter are used innovative technology Ba(NO3)2 crystals. The crystal unique properties, such as: optical homogeneity, 1047 cm-1 shift, wide transparency range allows utilization of these crystals for frequency conversion (practically) in any (360 to 1500 nm) spectrum regions. Unlike gaseous Raman shifters, there is no high pressure, complete safety of operation, low input threshold powers - all this provides you with additional ease of the usage. The RS-14 provides highly efficient conversion of tunable radiation from a Ti:Sapphire laser to tunable radiation of stimulated Raman scattering at 1st, 2nd and 3rd Stokes components. The optimum conversion in the RS-14 is achieved at pump with a Ti:Sapphire laser operating in the wavelength range from 815 to 900 nm. It allows to generate the tunable narrow-linewidth radiation from 690 to 1245 nm at the output. Used for radiation conversion Ba(NO3)2 crystal is located in the optimized cavity. Such an arrangement ensures high efficiencies of the laser output conversion to the 1st or 2nd stokes (30% or higher) along with a comparatively low output beam divergence (1.5 mrad), enabling thus further non-linear conversion of radiation. The diagram below illustrates the principle of the RS-14 operation. In the RS-14 are used 6 pairs of specially designed changeable cavity mirrors. By changing one mirror pair for another, highly-efficient generation of tunable radiation of the 1st, 2nd and 3rd Stokes components individually or together can be established at the RS-14 output. Low alignment requirements of the cavity mirrors together with ease of their replacement simplify the laser alignment procedure for operation in the wavelength range desired. Telescopic / focusing system that comes together with the converter, allows the RS-l4 to be adapted to any pump laser. A set of mirrors to provide simultaneous generation of the 1st, 2nd and 3rd Stokes radiation components. Wide-band dichroic coating for expanding of the tuning range for your Ti:Sapphire and Forsterite lasers. Telescopic system to ensure optimum power densities in a Ba(NO3)2 crystal. The device can be additionally supplied with FTIR shutter control unit. No more loosing of energy ! Up to 50% saved ! piShaper - laser beam shaping never was so easy ! With this unique tool it is possible to convert a Gaussian laser beam into a collimated flat-top (or top-hat) beam with nearly 100% efficiency. piShaper produces a collimated flat-top beam over a large working distance. 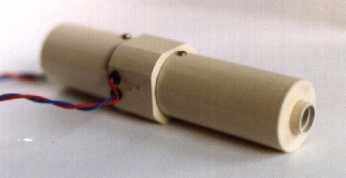 This enables the beam to be easily manipulated and re-sized with conventional imaging optics. Almost the same effective sizes of input and output beams (approx. 6 mm) make it easy to integrate piShaper to your application. Being originally designed as achromatic for two laser wavelength, 1064 nm (Nd:YAG) and 632.8 nm (He-Ne), piShaper could be easily tuned to work at other laser wavelengths within the range 355 – 1200 nm.